Welcome to the 25 Days of Simple Christmas! Each day I will be posting an idea about keeping the holidays simple- so that we can focus on Christ and the real meaning of Christmas! While Christmas is such a special day, so much of the joy gets lost in the busyness. 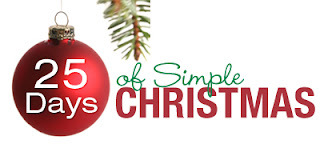 Each day I will be writing about a simple way to celebrate the season. To focus on family, joy, and memories, without the elaborate extras that can bring added stress. Simple can be more meaningful if it gives us more time to focus on the huge GIFT we are awaiting-Jesus Christ, our Savior. I just want to focus this post today on praying for those who really are without.